A Canadian tourist stuck dangling from a Las Vegas zip line about 80 feet above a street for nearly an hour is back on solid ground after being rescued by firefighters. LAS VEGAS -- A Canadian tourist stuck dangling from a Las Vegas zip line about 80 feet above a street for nearly an hour is back on solid ground after being rescued by firefighters. Firefighters rescued the man from the downtown Fremont Street Experience's SlotZilla zip line shortly after 3 p.m. Friday, Las Vegas Fire & Rescue spokesman Timothy Szymanski said. "Fremont Street Experience is investigating what happened and will do everything to ensure that this problem will not happen again," said company spokeswoman Lauren Silverstein in an emailed statement. SlotZilla workers initially assured firefighters that they could rescue the man and they stayed with him while he was suspended in midair, Szymanski said. Eventually, workers asked firefighters who arrived to reach the man with their truck's ladder, instead, sparing him more time suspended in the chilly Las Vegas air. The man wasn't injured and refused medical assistance, he said. The $40 "zoomline" rides involve flying over Fremont Street superhero-style facing the ground. The zip line begins at 114-feet from a 12-story slot machine sending riders on a 1,750-foot long trip to a platform in front of the Golden Gate casino hotel at the end of the street, according to information on the Fremont Street Experience's website. A witness below called at 2:34 p.m. to report a man was stuck above Fourth Street since about 2 p.m., Szymanski said. The company also contacted the fire department initially to report the stuck "flyer," said Tom Brumy, director of marketing for the Fremont Street Experience. Something caused the trolley that runs along the cable and is attached to the rider to jam, Brumy said. The attraction has hundreds of trolleys, and the one involved in Friday's incident had been taken out of service, he said. Brumy said he didn't know if it would be removed permanently. The man was never in any danger, he said. 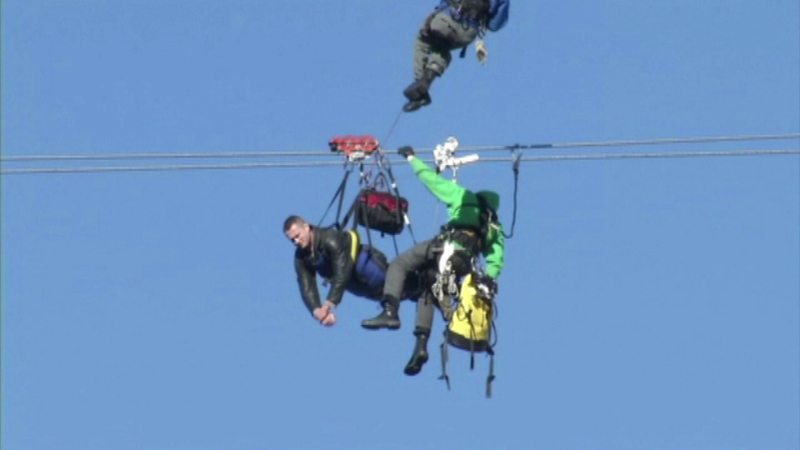 The company gave the man and his wife, who made it to the end of the zip-line attraction, a full refund, Brumy said. The company, which owns and operates SlotZilla, also offered them a ride back to their Strip hotel and a nice dinner at Fremont Street restaurant, but so far the couple hadn't taken them up on the offer, he said. Brumy wouldn't reveal the identities of the couple. Inspectors from a third-party company that works with the city and Clark County to inspect the area's attractions cleared the company to re-open the ride Friday evening, he said.